The Paramount in Huntington, Long Island for the ninth installment of their highly successful “ROCKIN FIGHTS” series next Saturday night, JULY 20.
welterweight contender Chris Algieri in a ten round main event against former world title challenger Mike Arnaoutis. 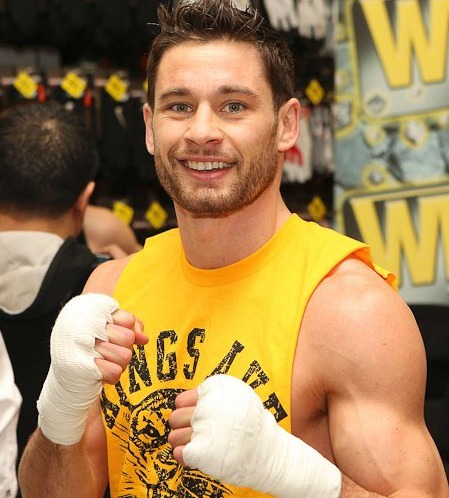 Sporting a record of 16-0-0 with seven knockouts, Algieri is coming off a career best victory, a dominant ten round unanimous decision over Jose Peralta on FEBRUARY 23 at The Paramount in front of a standing room only crowd. The bout was telecast LIVE on NBC Sports Network. “This is Chris’ sixth straight fight at The Paramount and as usual we’ve had a tremendous fan and media response to his fights. He fought very well against Peralta but Arnaoutis presents another tough test for him” said DeGuardia. Now living in Astoria, Queens, Arnaoutis, 24-8-2 (11KO’s), will be looking to get back in the win column, running off two wins prior to dropping a unanimous decision to Issouf Kinda on OCTOBER 13, 2012 at the NYCB Theatre at Westbury. Also returning to action at The Paramount on JULY 20, is Huntington native, undefeated lightweight contender Alan Gotay. Compiling a record of 5-0-0 with three knockouts, all-action Gotay will face off against Prichard, Alabama native Michael Doyle, 1-2-0 in a scheduled six round clash. Gotay has fought four times at The Paramount, most recently knocking out tough prospect Bryan Acaba on MAY 11 in front his growing legion of fans. In a six round junior welterweight tilt, Hicksville, New York native Anthony Karperis, 4-1-0 (2KO’s), will battle Queens, New York’s Jonathan Cuba, 6-5-1 (4KO’s). Karperis will look to stay in the win column, coming off a shut out four round decision over Carlos Nieves on MAY 11 at The Paramount. In an outstanding junior middleweight bout, undefeated local newcomers will battle as New Hyde Park, New York’s Rich Neves, 6-0-1 (3KO’s) takes on Enver Halili, 3-0-0 (1KO) of New York City. Neves will be making his 2013 debut, having fought five times last year, all dominant victories, while Halili comes off a four round unanimous decision win over Antonio Marrero on FEBRUARY 15 at the Mohegan Sun. Glen Cove based super middleweight Vincenzo D’Angelo will make his pro debut against Michael Mitchell, 1-2-0 of Patterson, NJ in a four round bout. Rounding out the card, Huntington based middleweight Wendy Toussaint will make his pro debut in a scheduled four rounder against On’rey Towns, 0-1, of Hillside, New Jersey. Starting at $50, advance tickets for “ROCKIN FIGHTS 9” are available through Star Boxing (www.StarBoxing.com, 718-823-2000) and Ticketmaster (www.Ticketmaster.com, 800-745-3000.). Tickets are also available at The Paramount Box Office (www.Paramountny.com, 631-73-7300.). The Paramount is located at 370 New York Avenue in Huntington, New York. Doors on the night of the event will open at 7:00 p.m. ET with the first bell at 7:30 p.m. ET.